Clan Donnachaidh, more widely known as the Robertson Clan, are without doubt one of Scotlands oldest Clans. And according to eminent historians, the Robertsons of Struan are without any doubt, the oldest family in Scotland. The first recognized Chief of the Clan Robertson, was Donnachadh Reamhair, known as "Stout Duncan". He led his Clan in support of Robert the Bruce, during the Wars of Scottish Independence, culminating in Bruce's famous victory at the battle of Bannockburn in 1314, where he defeated Edward II's army. The most precious relic belonging to the Clan is the "Clach na Brataich" or "Ensign Stone". This rock crystal was unearthed when the Chief's standard pole was pulled from the ground, while on the march to Bannockburn. It has been carried by every Clan Chief since, when leading the Clan into battle. The Clan's fourth Chief, Robert Ruabh Duncanson, was awarded the Clan Crest of a right hand holding an imperial crown, by King James II, as a reward for capturing the assassins of his father, King James I. Below you can see a photo of the Clan Crest. It is from this Clan Chief, that his descendants and Clansmen took their name, "Robert's son" or "Roberson". 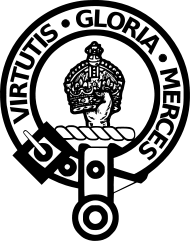 His lands were erected into the free feudal Barony of Struan, and he was given the Clan motto "Virtutis Gloria Merces" which translated means "Glory is the Reward of Valour. The Clan's war cry is "Garg'n Uair Dhuisgear", which is Gaelic for "Fierce when Roused"
In 1597 The Clan estates were almost lost, due to the reckless behavior of the tenth Chief. However due to the generosity of a wealthy clansman, an Edinburgh merchant called John Robertson the Clan's estates were saved. He purchased the estates, and deeded them back to his Chief in 1600. Below you can see a photo of a painting depicting a clan member dressed in the Robertson tartan during the late seventeenth century. During the late eighteenth century sheep were introduced to the Scottish Highlands, which saw the infamous Highland Clearances devastating many Scottish Clans. However none of the Robertson clansmen were forced off their land, indeed the Clan Chief mortgaged and sold off Clan lands to help support his clansmen during these times. The 18th Chief had to sell his Struan estate in 1854, to pay debts, and the last nineteen thousand acres of Clan land was sold in 1926, to pay off debts and estate taxes, after the death of the 20th Chief in 1910. 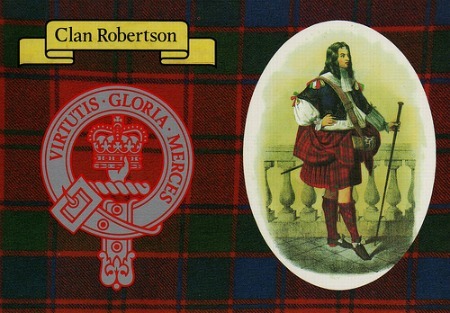 Below you can see the Robertson tartan being worn to a Burns Supper. The current Clan Chief is Alexander Gilbert haldane Robertson of Struan, 23rd Chief of Clan Donnachaidh. The word Donnachaidh is Gaelic and means Children of Duncan. In 1967 the clan society purchased a site on former clan territory, establishing a meseum and Clan center. 1969 saw the opening of the Clan museum at Bruar Falls, a few miles NorthWest of Pitlochry in Perthshire. The Clan Donnachaidh Society was founded in Scotland in 1893, to maintain and renew the bonds between clansmen now scattered across the world. There are now branches of the Robertson Clan all over the world, America alone has fourteen. If you would care for more information, or would like to know how you can join this famous Scottish Clan, then drop me a line using the contact us page, and I will be delighted to help.